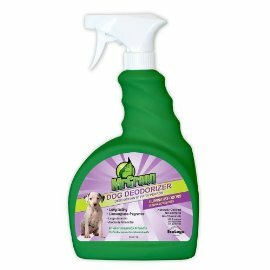 We use this product to clean our dog in between baths and it actually has made it so that we do not need to bath her as often! No harsh chemicals, Great Smell, HUGE bottle, Very reasonably Priced. It is such a convenience to have this on hand. All we do is spray 2 squirts on her back and then brush it through. To clean and deodorize her paws, we just spray it onto a wash cloth and wipe them. The smell is amazing. NO wet dog smell !! This bottle is HUGE , we have been using it weekly for 2 months and are only half way through it.